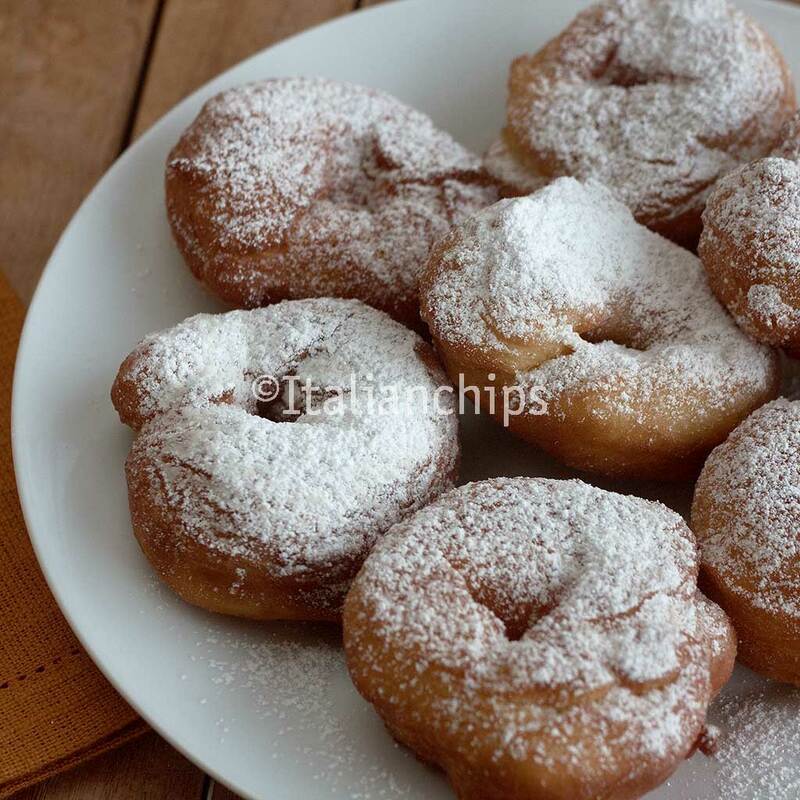 These are the typical Italian donuts prepared here for Carnival. This is also the original recipe of my husband’s aunt Pina ( a very common name in Italy, it’s the nickname of Giuseppina that comes from Giuseppe – Josef). 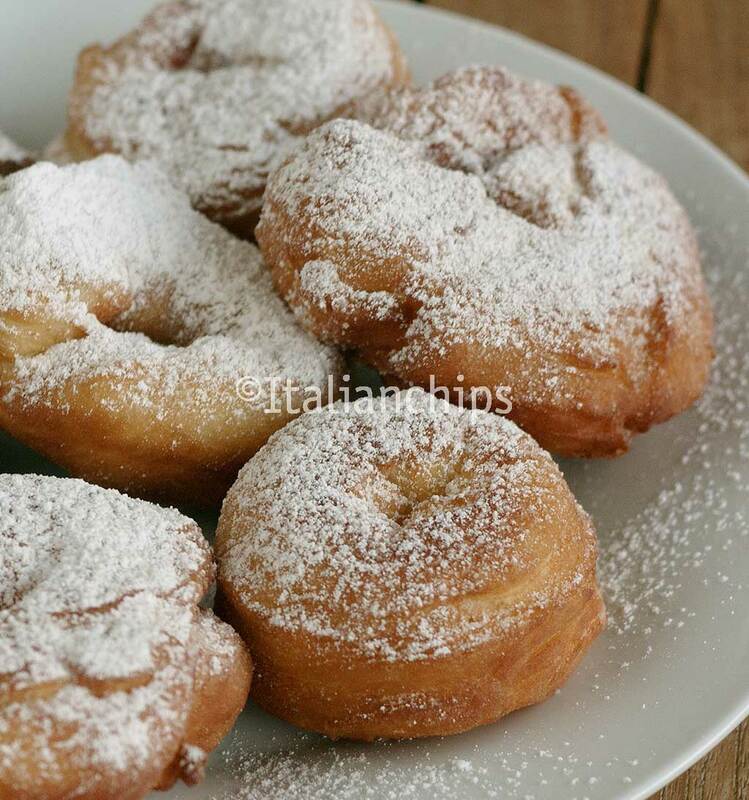 These donuts are tasty and easy to prepare. One of those recipes that “come by themselves”, with no risks and no need to be experts to prepare hem. 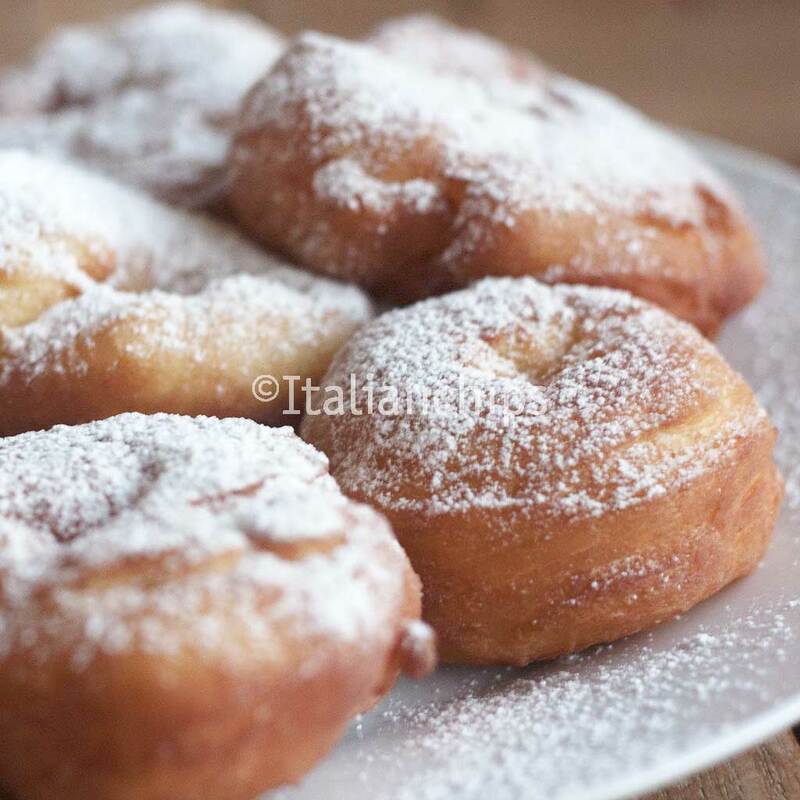 Here in Sardinia, these Italian donuts are prepared for Carnival but, in my opinion, they could be made all year over ;-). As I often say, I rarely fry. 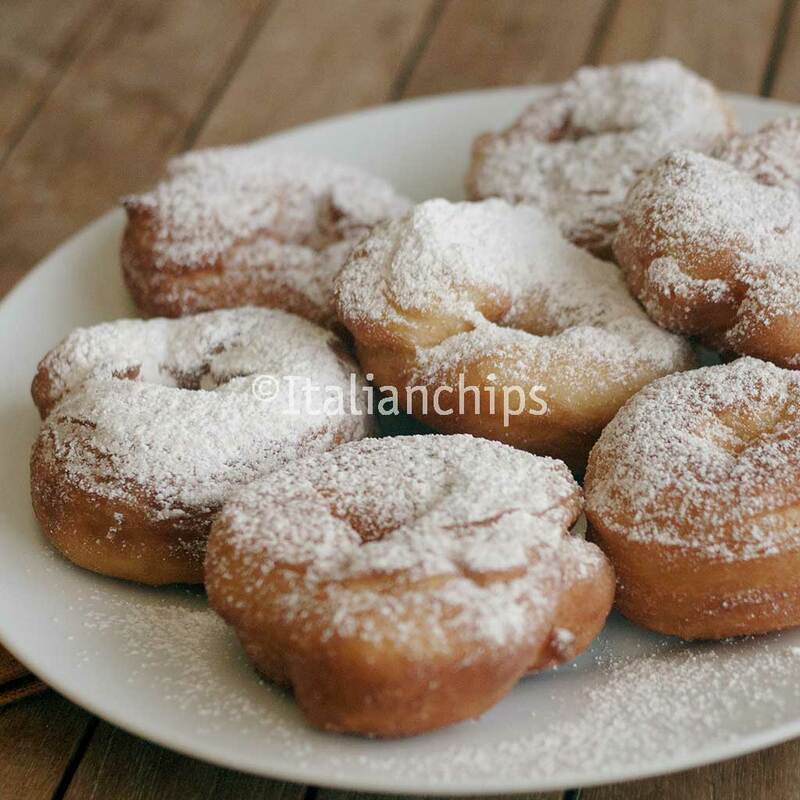 It has to be a great recipe to make me fry…and these donuts are a great reason to do so. I loved them, my daughter and friends too, but what gave me immediate satisfaction was my husband’s face (closing his eyes!) while eating one of these donuts! All of them told me the same thing: they’re lighter than the other ones!. 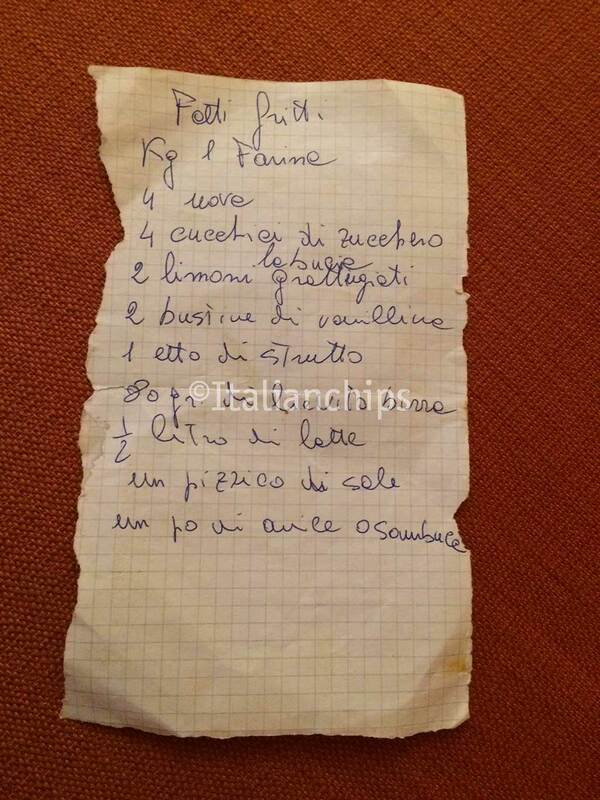 If you understand a bit of Italian, here you have the piece of paper with aunt Pina’s recipe that she gave me many years ago. I only used less yeast, but the rest is the same. Mix the ingredients by hand or using an electric mixer until well combined. Put it inside a big bowl (its volume will triplicate), cover with plastic wrap and put inside the oven with the lights on and leave it rest for a couple of hours (turn on the oven to 120°F to accelerate the process of leavening if you want. Take the dough and pour it onto a floured surface and take small portions at a time, making first a long piece that you will join the extremities to create the donut shape. Fry them on hot oil, turning upside down to cook the other side. 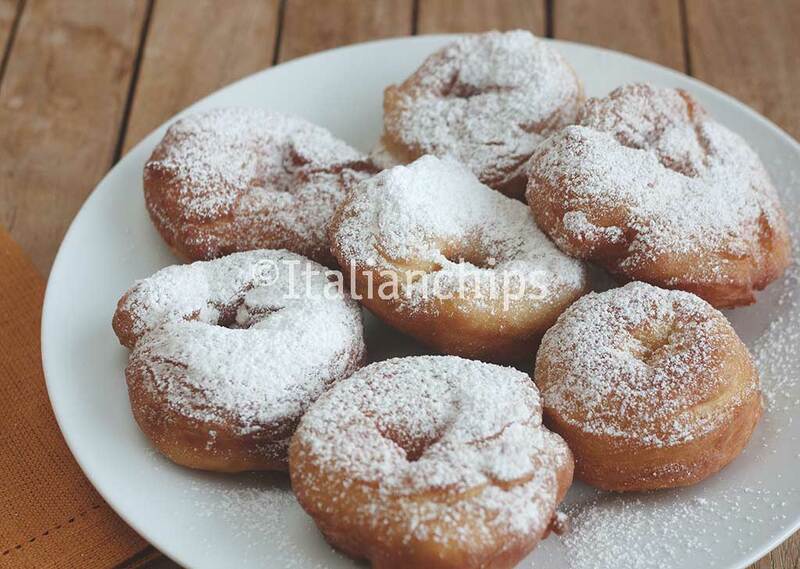 Put them on absorbent paper and then on a plate, covering them with icing sugar using a thin colander to spread it well all over the donuts. Cubes are just the shape fresh yeast is sold here in Italy. It is fresh baker’s yeast. I have never tried with dried one but I’d give it a try. I believe it may work the same. Please let me know how it worked.